You are probably wondering what's so complicated about taking a plant out of a container and putting it into the ground. My intentions are to make this procedure clear and help you avoid complications later. These plants have not yet outgrown their containers. First, when you are selecting a container-grown plant, pay attention to the container size in relation to the plant. 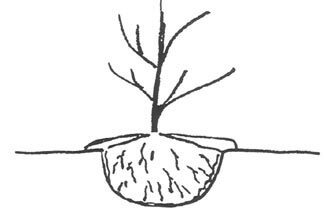 The container should be large enough to hold a root system without over-crowding it. If possible take the plant out of the container to see if there are more roots than medium. A good understanding of soils is the key to transplanting and good gardening. 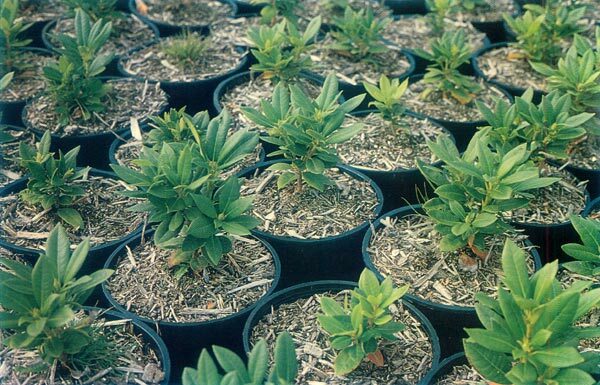 Ericaceous plants, such as rhododendrons, prefer a rich medium of organic matter and ample drainage. If possible, check the acidity of the soil or pH level (approximately 5.5 pH is optimum). Ifs very important if lime is needed to increase the pH to apply it at planting time. Limestone does not leach through the soil as readily as other elements so incorporate it in the root zone. Superphosphate (which promotes root growth and bud set) and gypsum (which keeps the soil friable for drainage and oxygen) should be added at this time. For those individuals who have sandy soil, gypsum is not necessary. Fertilizer is not needed at this time unless you are doing a whole new bed. Wait about three weeks when new regenerated roots will be growing out into the soil. Figure 1. A severely pot-bound plant is cut vertically with a garden spade. To achieve a greater success in transplanting a container-grown plant, the roots need to be severely lacerated. This will give the plant a chance to regenerate new rootlets, which then spread out into the surrounding soil. In most pot-bound container plants, there is a mass of roots at the base of the container. By hand or with a garden spade remove the mass. If the whole container is lined with roots it is best to tear the roots apart by hand. 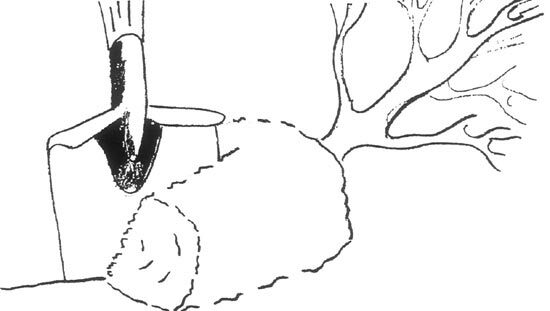 If the roots are very compact and dense, it is necessary to take the garden spade and cut through the bottom half of the ball vertically. The purpose is to expose more root area and promote root regeneration. The roots will now be able to grow out into the soil. Even with these measures some plants are too far gone. Figure 2. The plant on left has been lifted out of container. The plant on right is split and reshaped. 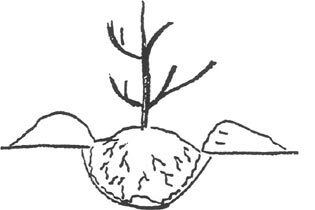 The hole should be wider than the ball so that the roots radiate outwards. Large rooted plants should be arranged so that no roots are tangled or lay to one side. Once a plant's roots are placed, that is the way they are going to stay. Figure 3. Dig a shallow hole wider than the root ball and reshape it for planting. This is very critical to the survival of the plant. Apply water at the base of the plant. Soilless media dries out quickly; therefore, a thorough soaking is necessary until the plant is established. being careful to avoid large air pockets. with feet and compress air out of soil. Let watering compress loose soil. Mulching plants will keep the shallow fine rooted plants cooler in the summer heat and act as insulation during the cold winter. Do not use peat moss as a mulch because when it dries it will shed water instead of absorbing it. Use any course material such as woodchips, bark, pine needles, etc. Course textured mulch will allow water to pass through to the roots below. If planted without following the above procedure, the plant may look normal. But when it becomes stressed by drought or severe winter the plant will start to deteriorate. Insects and disease will attack. In a few growing seasons the plant either dies or is retarded in growth. For the most part you should have greater success with your container plant if you follow these suggestions. Steven Feryok, a member of the Princeton ARS Chapter, was born and raised in the nursery industry and has been growing plants in the field and in containers for years.